Car park, hobby room, storage area, and more. These are just some of the most common uses for a garage in Chicago. So it’s no surprise that garage floors look ugly and beaten up. Imagine the amount of abuse, usage, and weight it has to endure. Good thing there is a way to update its look and make it a lot tougher to endure further usage. Say hello to Epoxy Coating. What is Epoxy Floor Coating? Epoxy is a two-part material that is known for its durability. As a coating, this mix of resin and hardener is a highly recommended solution for resurfacing concrete floors, especially those of the garage and basement. This seamless and non-porous coating comes in a variety of colors. For a more customized look, it can be integrated with single or multi-colored paint chips. Although durable, it is not stable enough to handle UV rays and extremely high temperatures. This is the reason why it is more efficient for interior floors. Easy-install Coating – Only a thin layer of epoxy is needed to coat a garage floor. It can be spread using a roller brush. It dries in just a few hours and is completely cured in a minimum of 3 days. Long-lasting — This coating is durable enough to last for years to come. It protects the concrete slab underneath, extending its lifespan as well. Resistance to Damage — Epoxy is resistant to almost any type of damage. Its non-porous surface keeps it from acquiring ugly stains. This material stays smooth and unscathed despite exposure to impact, abrasion, heavy foot traffic, and more. Appealing — With the variety of color options and customization techniques available, epoxy floors can be made more stunning than anyone has ever imagined a garage floor to be. You can make it look like a terrazzo floor or you can opt for a metallic epoxy floor. It’s up to you to make it match the overall style theme of the home. 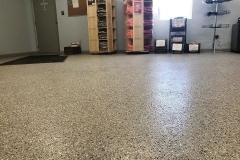 Slip-resistant — Despite the smooth and seamless surface that an garage floor epoxy coating creates, it as enough traction to keep it slip-resistant even when wet. Affordable — Compared to replacing the whole concrete garage floor, applying an epoxy floor coating helps save a big deal of money. With concrete replacement, here will be no need to hire people. Easy to Clean & Maintain – There is no special product or cleaning method to keep epoxy floors in pristine condition. Sweeping and an occasional wet mopping is enough to clean and maintain it. Eco-friendly — The fact that it restores old concrete, reduces carbon footprint caused by cement production, and lessens concrete waste at landfills is enough to credit it as an eco-friendly floor remodeling solution. Step 1: – The first thing contractors do is assess the garage floor, checking for any existing coating, sealer, or paint. They also check for any damage that needs to be addressed prior to installation. Step 2: – Existing coats are removed through stripping or grinding, whichever is appropriate. Step 3: – Surface repairs are done at this stage. The floor is then washed and dried completely in preparation for the epoxy application. Step 4: – Concrete etching will now proceed. This aims to make the concrete surface as raw as possible to enhance epoxy adhesion. This can be done through the application of a muriatic acid and water solution or citric acid. It is then rinsed off and air-dried. Step 5: – The resin and hardener are mixed and blended together. The coating is then spread onto the garage floor using a roller brush. Step 6: -Paint chips are broadcasted onto the epoxy layer before it dries. This way, the paint chips would be able to adhere. Any excess can be swept or vacuumed off after the coating as dried. For metallic epoxy floors, the metallic pigment is already added to the epoxy mix before it is applied. Step 7: – Another layer is added to seal the paint chips on the surface. Adding a sealer is optional. The amount of epoxy needed to completely cover the area. Work only with a reliable epoxy flooring company. Call (773)377-8976 today. When it comes to decorative concrete garage floors, epoxy is a popular choice. 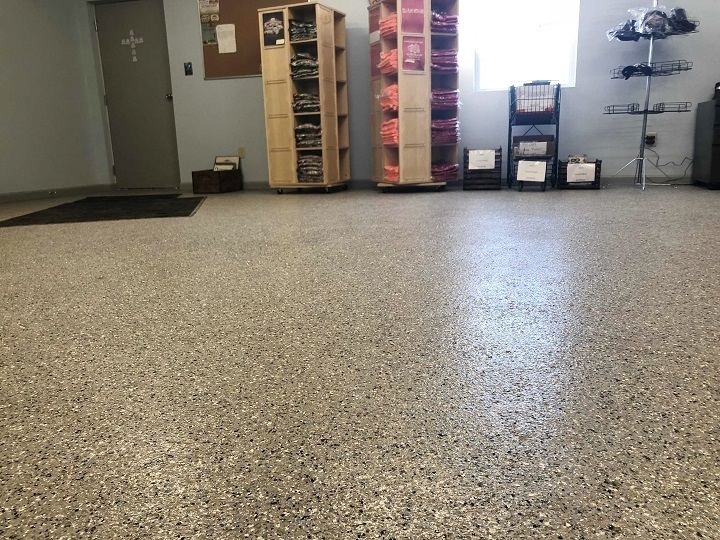 Our team of installers at Chicago Concrete Resurfacing is trained and experienced in the installation of this strong and sturdy coating for both residential garages and commercial showrooms. We take pride in our work and we make sure that each project we handle is a manifestation of our passion for quality. Isn’t it time to upgrade your old garage floor? Let us tell you more about epoxy flooring. Give us a call now!